There are many important reasons to use ARP main stud kits, including the elimination of main cap walk and fretting, as well as protecting the threads in your engine block. All kits come complete with hardened parallel-ground washers and high quality nuts. Some applications have provisions for mounting windage trays and have specially designed standoff studs with serrated lock nuts to position the windage tray and lock it securely in place. The studs are manufactured from 8740 chrome moly steel, heat-treated in-house to 200,000 psi tensile strength, and precision J-form threads rolled after heat-treat to create a fastener that has threads 1000% stronger than others. 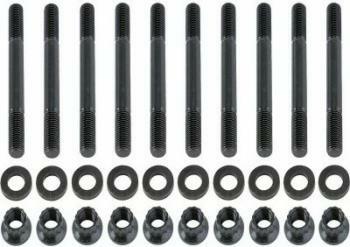 Far superior to any other main bolt kit offered for use in competition engines, ARP main bolts are designed to meet the exacting standards and demands of professional engine builders. Forged from 8740 chrome moly, all bolts feature generous under-head radius and rolled threads for the utmost reliability. The threads are rolled after heat-treating, which makes them about 1000% longer fatigue life than most main bolts, which are threaded prior to heat-treating. Available in the popular High Performance Series, which, at a nominal rating of 180,000 psi, is a premium replacement for OEM fasteners, or the 200,000 psi nominal rated Pro Series, application-specific main bolts with reduced wrenching head and are designed for use in competition applications. Parallel-ground, hardened washers are included with each kit. These have held up to tons of boost in my honda, no prblems. All my buddies run these.